Central Idea: Christ’s salvation is a gift for every human being. Doctrine: Love for the materially and spiritual poor. Practical Application: Christian service. To view the Lectionary 20 readings, click here. Jerusalem mystically represents the Church. The Church is the gathering of the children of God. Her light is Christ, the light of the world. The Church is for everyone. Jews and Gentiles will flock to her and bring their gifts, including the kingly gifts of gold and frankincense. R/ (cf. 11) Lord, every nation on earth will adore you. The Messiah is for the entire world and all lesser rulers will be subordinate to him, bringing him their homage and service. In turn, he governs with justice and brings profound peace. But the Messiah practices a ‘strange’ form of justice: He rescues the poor and the afflicted. Our Lord instructed us to pray to God the Father, “Thy kingdom come, thy will be done on earth as it is in heaven.” We can see what he meant in this psalm. We work for justice and peace; we bring our gifts to God by our service to others; we relieve the suffering of those who are poor in any way we can. This work of divine justice is always incomplete on earth but it will be perfected in heaven. and copartners in the promise in Christ Jesus through the gospel. 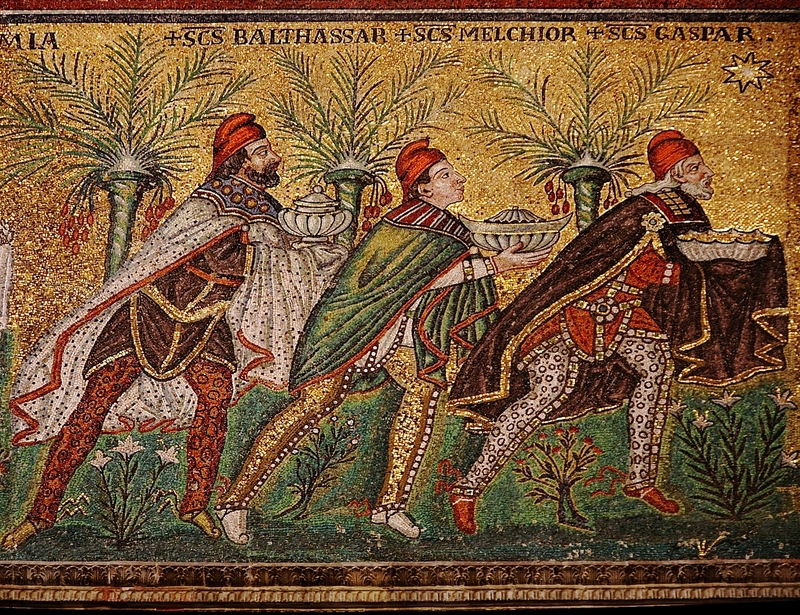 The gifts of gold and frankincense corresponds to Christ the King, whereas the myrrh indicates he would be put to death. The appearance of the Gentile magi are a sign that the Christ child is the Messiah, because it fulfills the prophecies that the nations would bring their wealth to Israel in homage. In this life, we contribute to the petition in the Lord’s Prayer “Thy kingdom come, thy will be done” when we work for justice and peace, develop the gifts God has given us, and give away the fruits of those gifts as a service to humanity, including relieving the suffering of those who are poor in any way. Paul VI famously said, “If you want peace, work for justice.” We work for justice when we give every person, whether the person is God or one of our fellow human beings, what we owe him or her. The Magi owed the new born Messiah their homage and give it. Herod did not owe the Christ child or the other innocent infant boys in the area of Bethlehem murder. In today’s readings the poorest man is Herod in his palace, because he is spiritually impoverished. In the current state of the world under the reign of original sin, all of us are poor in some way. The Catechism point § 2444 teaches us about the love for the poor that belongs to the Christian. In its widest sense, Christian service is every gift of self we make to others. As such, Christian service should be as continual as our heartbeat. The beneficiaries of our Christian service should be our families, friends, those we are in contact with through our work, those we can assist through our prayer, those we reach through evangelization, and anyone we can touch who is materially or spiritually poor. Young people are often given an opportunity or required to do service through their schools. This can become Christian service by putting one’s head and heart into it, offering the effort to God for the good of those receiving the service. Is there someone I am supposed to be serving right now? Is there someone I am serving right now? Am I really serving by putting my head and heart into it, offering it to God for their good? Every time we do what we are supposed to do we are serving. These works of justice (doing what we are supposed to do) are works of service. Christ came not to be served but to serve, even to the point of giving up his life (Mt 20:28). We have the opportunity do be like Christ (to serve). These opportunities are found in the ordinary circumstances of our lives.